Among the variety of problems that can arise in individuals that fail to properly manage their diabetes, your Beaverton dentist wants you to know that those who can’t or don’t control their blood sugar levels are far more likely to suffer from permanent tooth loss due to periodontitis, a severe form of gum disease that destroys the soft tissues and bone structure that hold our teeth into position. While researchers have long understood that this connection exists, the cause of why it happens has yet to be clearly identified. However, a new study conducted by researchers at the University of Pennsylvania has found that unmanaged diabetes actually alters oral bacteria so that microbes are more capable of causing disease. That means more inflammation of gum tissue and a higher risk of periodontitis. Researchers hope their findings will lead to improved treatment of patients suffering from diabetes – along with anyone else who suffers from severe gum disease. “Studies done on the microbiome had been quite limited,” states Penn Dental Medicine’s professor Dana Graves, the study’s lead author. Roughly 47 percent of Americans over the age of 30 and more than 70 percent of adults 65 and older suffer from some form of gum disease, according to the latest survey conducted by the Centers for Disease Control and Prevention. The most common form is gingivitis, which causes bleeding of the gums and low-level inflammation, but not the permanent loss of bone and gum tissue caused by periodontitis. By practicing quality oral hygiene daily – and by scheduling regular dental exams and cleans with your Beaverton dentist – gingivitis is easily treatable and preventable. However, the damage caused by periodontitis is irreversible. While far less common – only 15 to 30 percent of dental patients actually suffer from severe periodontitis – the disease still ranks as the leading cause of permanent tooth loss in adults. Individuals that suffer from poorly managed diabetes are 3 times more likely to develop periodontitis. In the recent Penn study, researchers compared the oral microbiome of healthy mice with other animals that suffered from diabetes. Researchers discovered that the two groups had similar profiles before the diabetic mice developed hyperglycemia, or high blood sugar levels. With elevated blood sugar levels, the oral microbiome of the diabetic mice changed, creating a less diverse and more disease-causing ecosystem of bacteria. “The diabetic mice developed periodontitis, a loss of bone supporting the teeth, when the blood sugar levels rose,” reports Dr. Graves. Next, researchers needed to discover whether the microbial changes were the cause of the disease. Researchers tested this by moving microbes from a diabetic mouse to a mouse without diabetes. Researchers discovered that the transferred bacteria from the diabetic mouse created additional inflammation and bone loss in the previously healthy mouse. Researchers also discovered that certain inflammatory markers – especially IL-17, a type of molecule that plays an important role in inflammation and immune response – were increased in the animals with diabetes. Increased levels of IL-17 in humans has also been linked with periodontal disease. While injecting an antibody into the gums of a human isn’t an option, “it suggests that if you can control inflammation, you could reduce the susceptibility of diabetics to periodontal disease. We need a way to target it a little more carefully,” reports Dr. Graves. Periodontal disease is largely preventable. 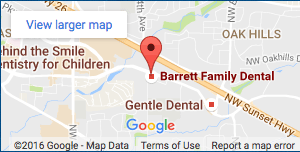 By maintaining a quality oral hygiene routine, scheduling regular dental exams and cleanings with your Beaverton dentist and good blood sugar regulation, even patients suffering from diabetes can enjoy healthy teeth and gums for a lifetime.